These two warblers are nearly identical from below except for that tiny wash of yellow near the vent on the Black-throated Green Warbler (R). Many birders in North-central Texas have a difficult time determining species when looking straight up at the bird in question. Wishful thinking frequently pushes inexperienced birders to check the box next to Golden-cheeked when in fact, they are looking at a Black-throated Green Warbler. Getting the bird to pose in a profile position solves the identification problem. The male Golden-cheeked Warbler has a clean black line running through the eye, not a gray one. The same is true for the crown and nape - black on Golden-cheeked Warbler male and gray on the Black-throated Green Warbler. The female Golden-cheeked Warbler has a thinner gray line through the eye that doesn't bleed onto the cheek (see the female Golden-cheeked Warbler below). In this position, you may also see a hint of a black back on the male Golden-cheeked Warbler. If the bird in question comes down in the canopy low enough to see the back, the ID is generally a slam dunk. 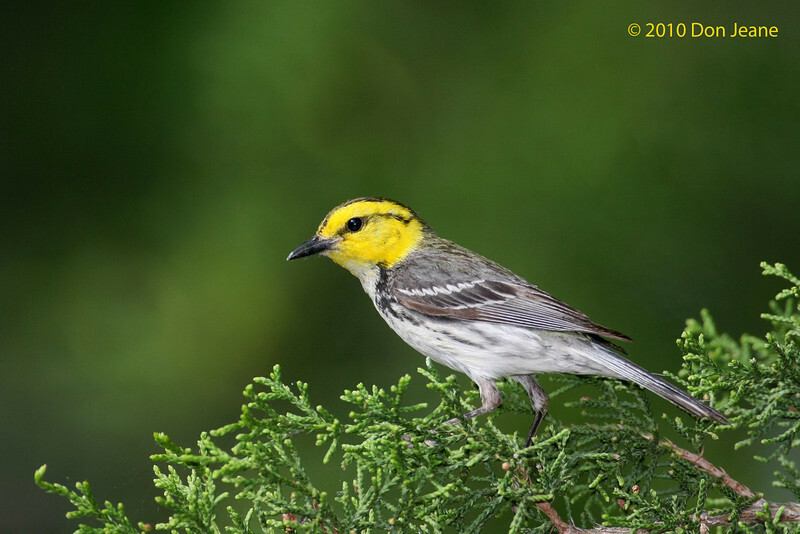 On male Golden-cheeked Warblers (pictured here on left), the back is entirely black. On female Golden-cheeked Warblers, the back is almost entirely gray with little hint of yellow or olive as is seen on the Black-throated Green Warbler (right). 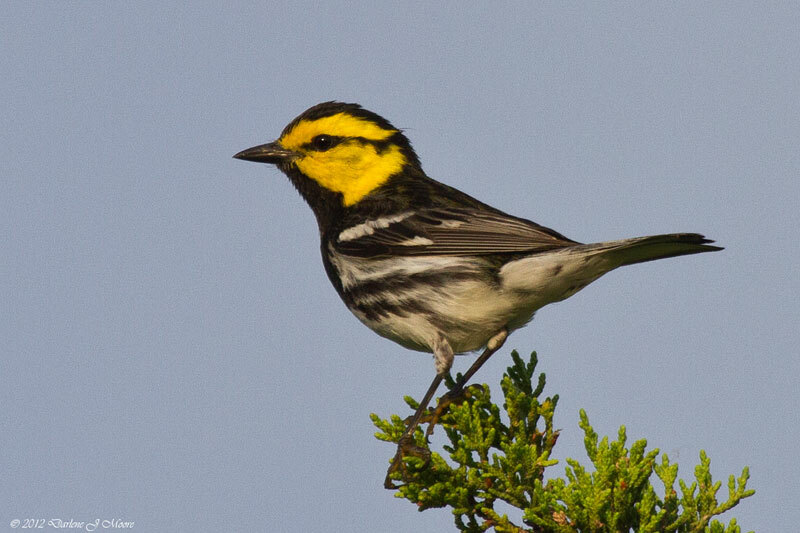 Male Golden-cheeked Warbler, Somervell County. Photo by Darlene Moore.